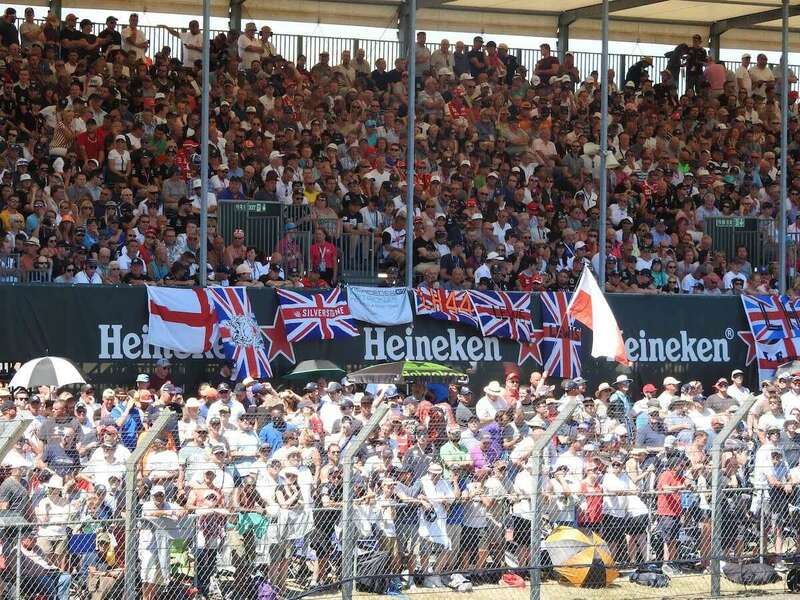 Your guide to buying tickets and the best places to watch the action at Silverstone for the 2019 British Formula 1 Grand Prix on July 12-14. 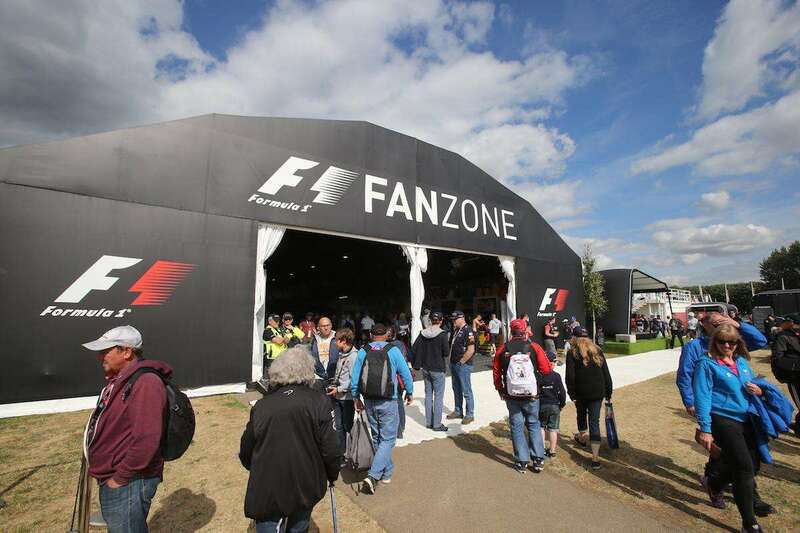 Official Ticket Packages from F1 Experiences at Silverstone include select grandstands or access to VIP hospitality in the Champions Club or Formula 1 Paddock Club™. Additional benefits include driving tours of the track, opportunities to meet current and legendary Formula 1 drivers and access to the F1 Paddock. *All tickets for 3 days. 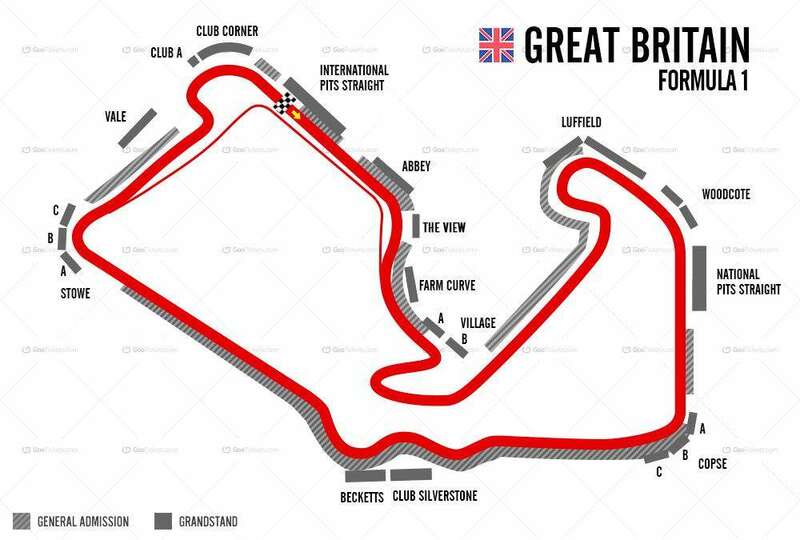 2018 British Grand Prix grandstands map. Click to open a large version in a new window. Sunday only tickets are available for all grandstands, though you only save around 10% on three-day ticket prices. Children’s tickets (aged 15 or under) are available in all grandstands at a 50% discount. The child needs to be accompanied by an adult holding an equivalent fully-paid ticket. Single day General Admission tickets are available: £50 on Friday, £95 on Saturday and £159 on Sunday. The Friday tickets include roving Grandstand access. Children under 10 get free entrance to General Admission, whilst tickets for children 11-15 are priced at a 50% discount. The General Admission (GA) offer at Silverstone is pretty decent, and goes some way to justifying the high ticket price. GA areas cover almost the whole circumference of the circuit and offer excellent vantage points at some of the best corners. In many cases, the GA areas are located directly in front of the grandstands. The organizers have also invested in improving the GA experience in recent years by increasing capacity, constructed raised viewing mounds and moving some perimeter fencing to get fans to get closer to the action. 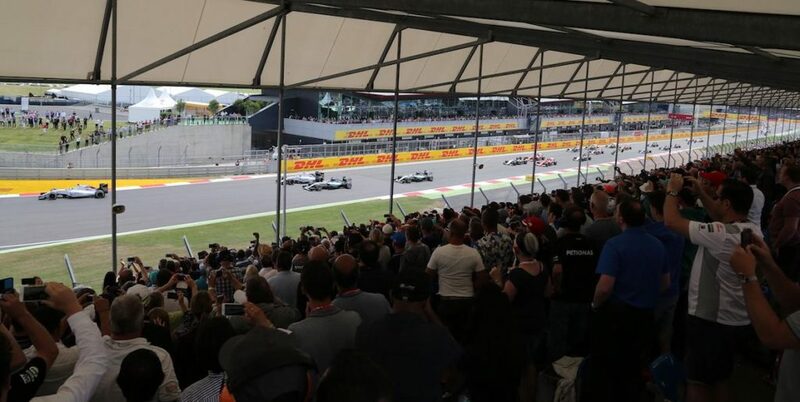 Some of the best General Admission viewing areas at Silverstone include the International Pits Straight (with a view of the start/finish line), Stowe, Luffield, Beckets, Vale and Copse Corner. It’s important to secure your chosen spot in General Admission as early as possible, particularly on Saturday and Sunday as the popular areas get progressively busier over the course of the weekend. All the grandstands at Silverstone offer big screen viewing, whilst around half of the grandstands (the more expensive ones) are covered. For the first two days of the event, all grandstand tickets are ‘roving’, meaning you are free to check out the views from other Grandstands (with the exception of Club Silverstone). Be aware that the most popular grandstands do fill up, especially on Saturday. On Sunday, you will need to sit in your allocated seat. 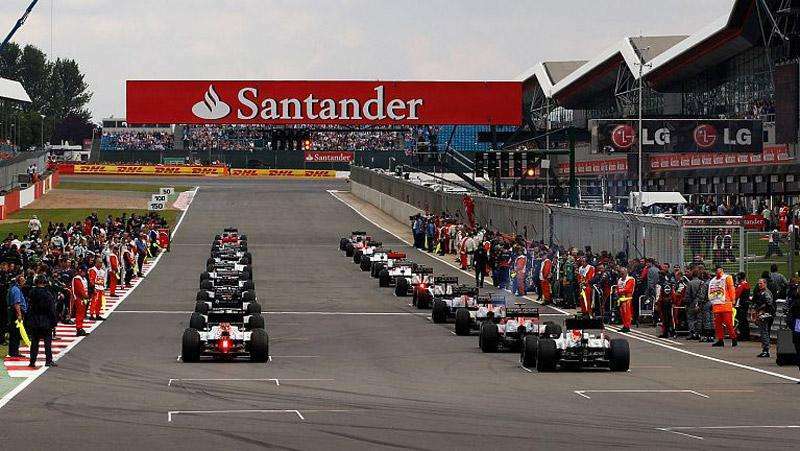 The large, popular International Pits Straight grandstand is located opposite the pits complex and is the best place to watch the start, finish and pitstops at Silverstone. There are four sections in this grandstand (blocks 2-5). The best tickets are in block 2, closer to the start of the straight (after Club corner). Block 5 tickets are at the other end of the straight (closer to Abbey corner). The Club Corner grandstand is on the final corner of Silverstone, leading on to the International Pits Straight. It’s a solid and popular Grandstand choice at Silverstone. There are four sections in this large Grandstand – the best tickets are in section 2, closest to the pits area. Great seats for the best view of the Podium celebrations after the race. The Becketts grandstand is located on one of the most demanding sections of any Grand Prix circuit. The Maggots-Beckets esses at Silverstone are a high-speed test of drivers’ skills and a great place to watch the action. The run-off area here is wide, so the stands are set back from the cars, but the views are panoramic and you also get a view of the village corner on the opposite side of the track. Abbey grandstand is located at the end of the International Pits Straight, right next to the opening Abbey corner. From these seats, you get a distant view of the final Club corner, pitstops and start/finish of the race. Abbey corner and on to Farm. A solid choice. Luffield is a slow corner which offers a prolonged view of the cars from the Wellington Straight all the way to the National Pits Straight. The Luffield A & B Grandstands were merged in 2014. Woodcote A (video above) is a better choice than Woodcote B. From Woodcote A, you get a good view of the slow-speed Luffield corner before the cars accelerate out of Woodcote and down the National Pits straight. The more expensive, covered Village B grandstand offers an extended and close-up view as the cars take on the difficult slow-speed Village and Loop corners. From here, it’s also a short walk to the Village stage on the infield where concerts are held each night on Grand Prix weekend. The cheaper Village A (video above) is also an excellent choice. From Village B, you get a great extended view of the cars as they take on the slow and technical Village and Loop corners which present a real test of the driver’s skills. Big screen viewing is available. You are also close to the Village stage on the infield where some of the best off-track action happens on the weekend. The covered National Pits Straight stand is located on the straight between Woodcote and Copse at the half way point of a Silverstone lap, overlooking the old pits area. There is big-screen TV viewing available for fans and a good atmosphere. The three Copse grandstands (A,B,C) are located on the outside of Copse Corner, a super-fast right hander at the end of the National Pits Straight. These three stands are covered and offer good views for the price as well as big screen TV viewing. We recommend choosing Copse A or B rather than Copse C.
There are two sections in the Vale grandstand. Band 8 tickets are better, as they have a better view of the slow Vale Corner, as well as the final Club corner and the end of the International Pits straight. The Band 9 seats have views of several corners including Stowe, Vale, Club and Farm, as well as Hangar Straight. There are three stands on the outside of Stowe corner (Stowe A,B,C) a 3rd gear right-hander taken at almost 200 km/hr. The Stowe stands are good value, but are set back from the track due to the large run-off area. A big screen TV is located near to Stowe C and visible from all three stands. The best views are from Stowe B, followed by Stowe C and Stowe A. Been to the British GP at Silverstone? Leave a comment and tell us your favorite grandstand. Hi Wendy, you can check out the general admission areas any time, including Sunday. Hi Anne, Silverstone is pretty well equipped for disabled fans. Check here for more information about viewing areas for disabled fans. I’m sure the gate staff or information point staff will also be more than willing to offer advice. Hope you have a great weekend! Does anyone know the difference between a Level 3 and Level 4 general admission ticket? we have a level 4 for Sunday…. I have Club Silverstone Tickets. Can i also go to the other Grandstands at Friday and Saturday? Yes, you can. Grandstand seats are only reserved on Sunday, but the popular grandstands can get full on the other days. Hi. If you had to chose between the Stowe or Village grandstands for race day, which would you chose? Which is best? Hi I just tried to book international straight disabled seats, but told there is going to be a hotel. So had to book Abbey. Is this true as it seems such a waste as it’s a prime spot for the podium and good view of track. Hi I’ve just read that general admission for the 2019 British Grand Prix isn’t going to be available. Anyone know if that’s correct? This is not correct Lee. I’ve just double checked the Silverstone website and General Admission tickets are available. They cost 185 GBP for the weekend. Thank you very much for your information. It is very helpful! When I try to buy tickets through the official F2 site it says they’re not available, and I’ve left my email for months now to be advised of when they are available. I can see tickets for sale on a different website but am nervous to purchase them anywhere other than the official site? Are you able to recommend the best place to purchase? Also, is it helpful to arrive really early to try and secure a good spot or do the gates not open until the start time anyway? Hi, Ive booked 4 GA ticekts for this years GP. Any thoughts on purchasing a fast track or inner circuit upgrade? Hi Shaun, both could be a good investment – especially access to the Inner track – you can see the support pits and also get closer to the F1 Paddock to score some autographs. Hi. I am thinking of booking 2 Woodcote hospitality tickets for Sunday as a special gift surprise. Is this worth the big price tag? Are there allocated seating and great views? Thanks. Hi, Which stands get to open gates to get on the track for the post race ceremony, please?